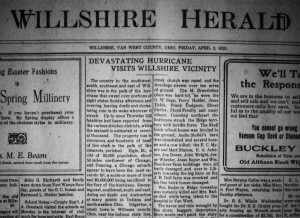 DEVASTATING HURRICANE VISITS WILLSHIRE VICINITY—That was the headline of the Friday, April 2, 1920 edition of The Willshire Herald. It was published less than a week after one of worst tornadoes swept through this part of the country. Why do I have an interest in tornadoes? A while back my mom gave me some old photos. Among them were some showing the aftermath of wind damage and one of a barn being rebuilt. I suspected these photos may have been taken at the Schumm farm, east of Willshire, where my mom grew up. Her grandfather, Lewis J. Schumm, purchased the farm in 1878 and the farm has been in the family ever since. However, the barn roof has the date 1886 on the shingles. No one that I have talked to has ever heard that the barn was once destroyed and rebuilt. My mom only has knowledge that the orchard was destroyed by a tornado many years ago. My research mission this time was to find out if a tornado had ever hit the Schumm farm. So, I headed off to the Brumback Library in Van Wert and to the Mercer County Public Library in Celina to look through some area newspapers on microfilm and see what I could learn about local tornadoes that occurred nearly 100 years ago. I have included a list of the newspapers I used as sources of information at the end of this blog. Quite a few tornadoes have gone through this part of the country over the years. I remember the Palm Sunday Tornadoes in April 1965 as well as the tornadoes that struck Van Wert County in 2002. 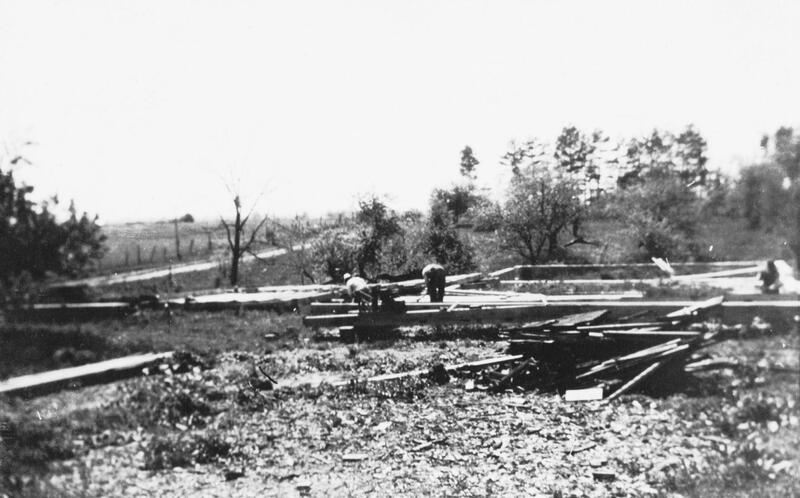 The Willshire area was also hit by a tornado in March of 1918. But a group of even more destructive and deadly tornadoes struck the area on Sunday, March 28, 1920 at 7 o’clock in the evening. There was extensive wind damage near Chicago before the storm moved into Indiana and Ohio. The 1920 Van Wert Times referred to it as the worst tornado in the history of Van Wert. The storm followed a path similar to that of the 1918 tornado. Although the 1920 storm was not as wide across as the tornado two years before, it was more serious. It came from the southwest, crossed parts of Mercer County and went on into Van Wert and Auglaize Counties. Just about every township in Van Wert County, as well as portions of Mercer, Auglaize and Darke Counties were struck by the high winds. Also hard hit were Monroeville, Bryant, Geneva, Berne, and Zulu in Indiana. DEVASTATING HURRICANE VISITS WILLSHIRE VICINITY—(The Willshire Herald, 2 April 1920, front page): The country to the southwest, south, southeast and east of Willshire was in the path of the hurricane that swept over portions of eight states Sunday afternoon and evening, leaving death and devastating ruin in its wake wherever it struck. Up to noon Thursday 326 fatalities had been reported from the various stricken districts, while the maimed is estimated at several thousand…Edgerton, a small town in Williams county, Ohio, near the Indiana state line, was practically wiped out of existence, as was the little hamlet of Zulu, a few miles west of the state line…the country surrounding Geneva and Berne was visited [and] several persons, relatives of Willshire people, were killed and injured. Fred Miller, a son of Mr. and Mrs. Dave Miller of this town, had both legs broken, and his wife was also painfully injured. Mrs. Simon Riffle, mother of Mrs. Fred Miller, was killed, as was her grandfather, George M. Ramseyer, aged 82. The entire Riffle family was more or less injured… Mr. and Mrs. Ralph Smitley and children were seriously hurt. Edward Anspaugh, also of the Berne district, whose back was broken, is a cousin of Mrs. W.A. Dull and Mrs. G.M. Clouse of this town. The dead in the Bryant district total nine, and the Geneva district three. Tearing on east the hurricane struck the Willshire territory in the Milo Campbell-W.E. White neighborhood, spreading out from one-half to one mile in width…The Campbells were left without shelter…Will Evans had his house wrecked and barn demolished. 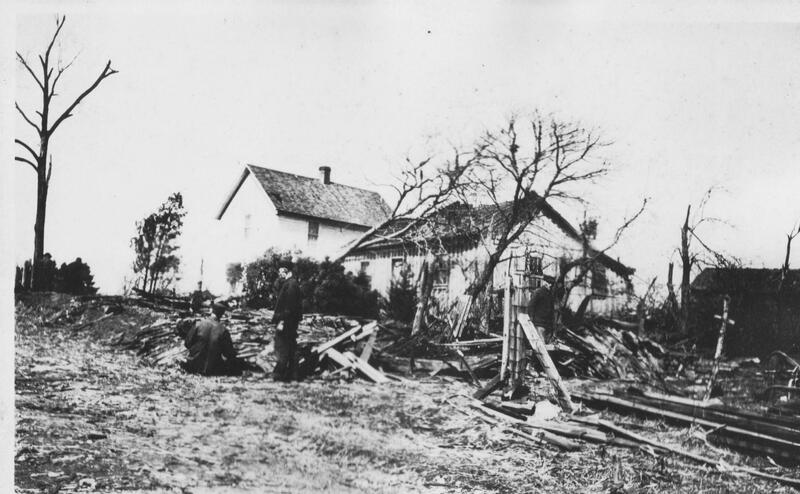 The Duckcreek church was razed and the wreckage strewn over ten acres of ground. The M. Branstetter place was hard-hit, as were the G.W. Sapp, Perry Hoblet, Jesse Tickly, Frank Dudgeon, Elmer Stetler, Floyd Friedly and many others. Coursing northeast the hurricane struck the Ridge territory with terrific force. 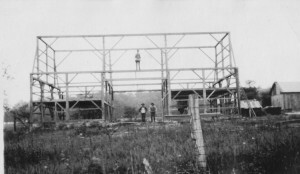 The Shell brick school house was leveled to the ground; Audie Stetler’s barn was demolished and several horses and a cow killed; the F.C. Myers and Mart Stamm, E.A. Acheson, Joe Doner, John Wright, Jesse Wheeler, Jesse Boyer and Wm. 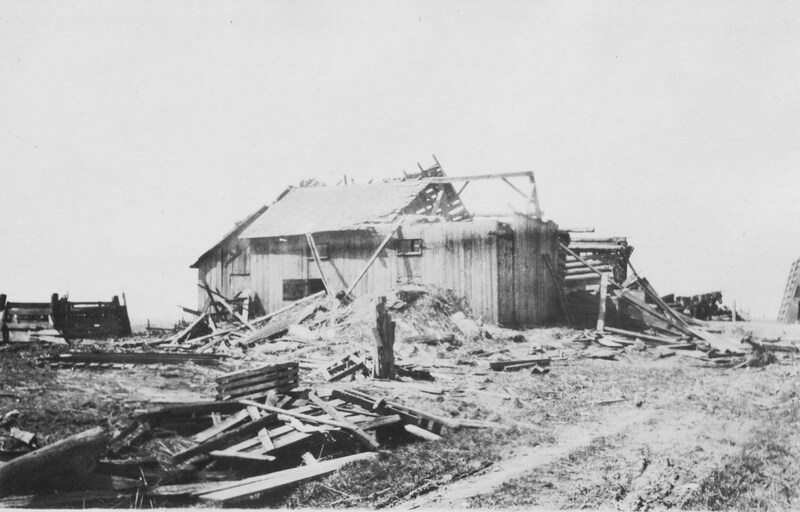 Buechner farm buildings were all badly damaged, and over in Liberty Township the big barn on the J.M. 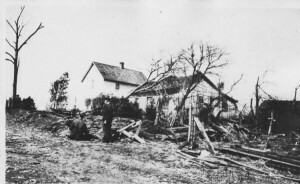 Dull farm was wrecked and his fine brick house damaged. Wm. 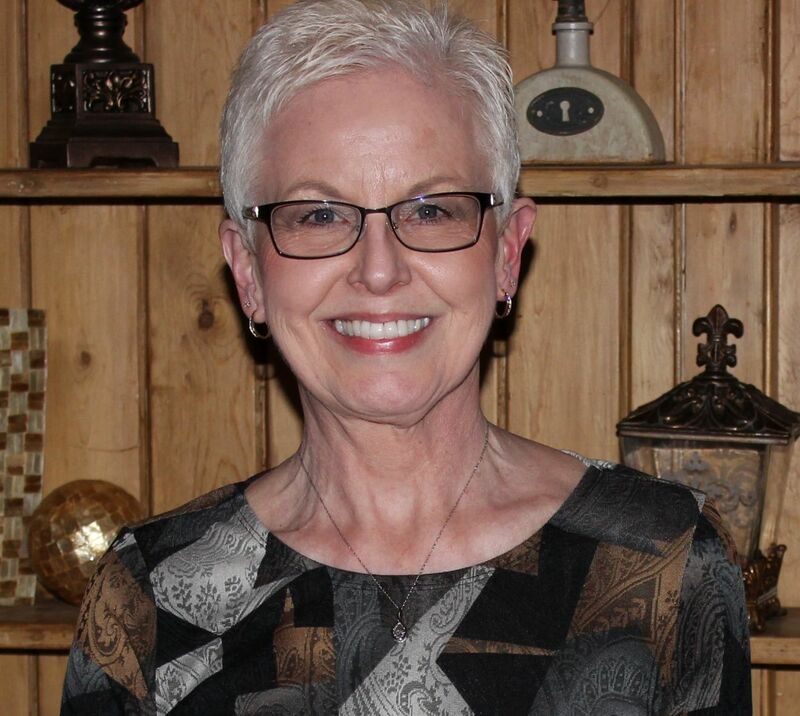 Rader in Ridge Township was instantly killed and Mrs. Rader died while being taken to the hospital in Van Wert. 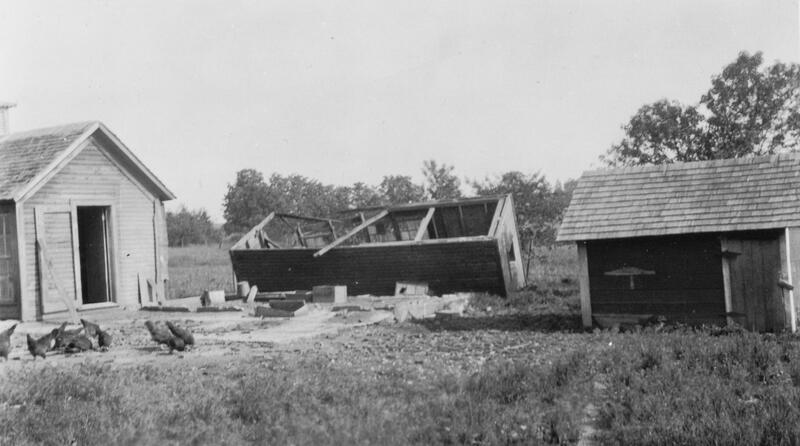 Damage after 1920 tornado, Van Wert County, Ohio. SWEPT BY TORNADO was the headline of the April 1, 1920 edition of The Rockford Press. This newspaper reported the damage in Mercer, Auglaize and Darke Counties in Ohio, as well as in Indiana. Sweeping across many states, spreading devastation and taking its toll of human lives, the terrific windstorm struck this section early Sunday evening. While the wind blew a stiff gale all day, the sky was clear and the sun shone brightly and no one really suspected that a cyclone was on its way. Mercer County was indeed fortunate there was no loss of human life. Many people had narrow escapes; some were blown out of their homes, yet landed safe. The loss of livestock is large. The animals being crushed under the falling structures, struck by flying timbers or dashed to death. At Moulton, in Auglaize County, the new Lutheran Church, the Methodist and the United Brethren Churches were all blown down. Services were being held in the Lutheran Church when the storm came up and the pastor advised his congregation to go to the cellar, which saved many of his members from death. A department store and an elevator were wrecked…eight residences were demolished. The reported dead are Henry Lechner aged 16; the six year old son and a four year old daughter of John Kacheiries; and another child was missing. In Darke County there were eight dead and 30 injured. In Jay County, Indiana, the little town of West Liberty was struck and only three houses left standing…The death list there includes Frank Smith, Mrs. Goldie Smith, Florence Smith, Clarence Smith, Mrs. Frank Haggot, Keith Haggott, David Kessler, Mable Fields, Katharine Fields, Katherine Gross. 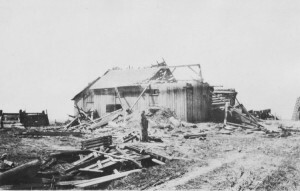 The storm struck heavily east of Berne, Indiana, and damaged many houses and buildings. Monroeville, Indiana, was touched by the storm and in a district north of the town Mrs. William Simons and two children named Giant and Grodian were killed. The damage reported in Willshire Township: Louis Schumm, barn down; William Buechner, barn destroyed and dwelling seriously damaged; Otto Stetler, barn destroyed and three dead horses; Robinson house and barn down; Jesse Boyer and Jesse Weiler, houses and barns badly wrecked; barns destroyed at Jacob Gunsett, Thomas Friedly, Maynard Stetler, Jesse Tickle, and Dudgeon farms. The George F. Robinson farm in Van Wert County occupied by Frank Wright was swept of its buildings. [This may be the Robinson farm mentioned above.] In all there were fourteen barns destroyed in Willshire Township. Blackcreek Township, Mercer County, also suffered severe losses. The 1920 tornadoes were deadly. A day after the storm a resident near Convoy reported that Dr. Morgan of Dixon found seven dead between New Haven and Monroeville and that he and had not yet reached the worst part of the damage. Mr. & Mrs. William Rader were both killed. Darke County, hardest hit in Ohio, reported eight deaths. One family there lost the father and three children. Mercer County escaped without the loss of life. The Van Wert Daily Bulletin, Tuesday, March 30, 1920, reported that over 176 were killed in eight states: Illinois, 30; Georgia & Alabama, 75; Ohio, 32; Indiana, 28; Michigan, 9; Wisconsin, 1; Missouri, 1. Others were seriously injured: Mrs. Fred Stephenson, two ribs and an arm broken, a scalp wound and badly bruised; Fred Stephenson, bad cut on the side of his face, scalp wound and bruises; Myron Stephenson, left leg broken below the knee, bruises; Mr. & Mrs. Martin Roth, scalp wounds and bruises. It was rumored that a piano belonging to the Leplys, east of Van Wert, was picked up by the wind and landed on some power lines. It was also reported that the tornado, almost a mile wide, moved a house several feet on its foundation. The 1 April 1920 edition of the Van Wert Twice Weekly Bulletin estimated the loss of property from the storm in Van Wert County at $2 million. The paper also reported that many residents discovered too late that they were not covered by insurance. Apparently during the month preceding the storm some families neglected to transfer their insurance policies after they had transferred ownership of farm lands. They were not insured, according to insurance company rules. The 1920 tornado is also mentioned in the history of Duckcreek Church, Mercer County: Late in the evening of March 28, 1920, just after dark, the church was completely blown apart by a cyclone. It destroyed the church building and turned over or broke cemetery stones, but the church bell came straight down and was later moved and used in the Mount Hope Church, four miles to the west. 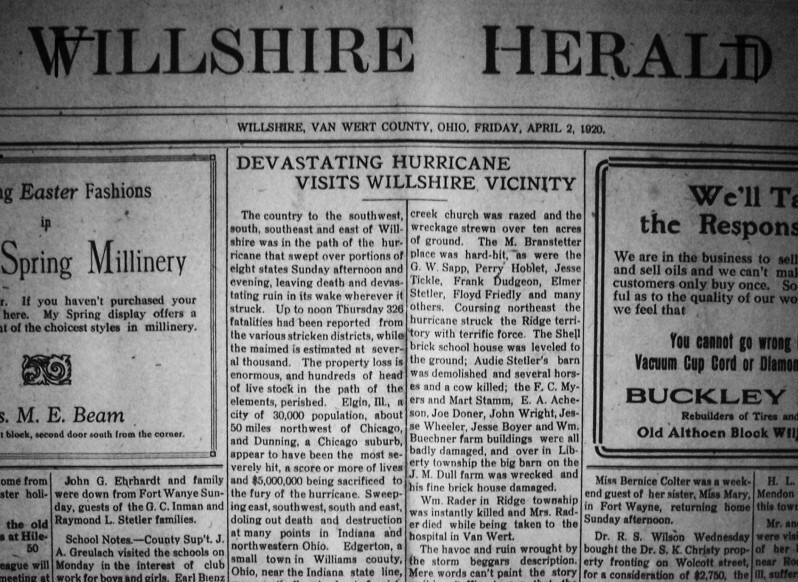 The Willshire Herald was the only area newspaper that referred to this storm as a hurricane. Did we really have a hurricane here in landlocked west central Ohio? According to Dictionary.com, today’s definition of a hurricane is 1. A violent, tropical, cyclonic storm of the western North Atlantic, having wind speeds of or in excess of 72 mph. 2. A storm of the most intense severity. 3. Anything suggesting a violent storm. Webster’s Dictionary, copyright 1943, defines a hurricane as A gale of extreme violence characterized by fitful changes of the wind and, sometimes, thunder and lightning. According to those definitions, you could call the storm that hit the area in 1920 a violent hurricane. I still don’t have the answer to my original question. The newspaper article said the Louis Schumm barn was destroyed by a tornado but no family members remember Louis or Cornelius talking about a tornado that destroyed their barn. The barn’s slate shingles appear to be the original 1886 shingles. 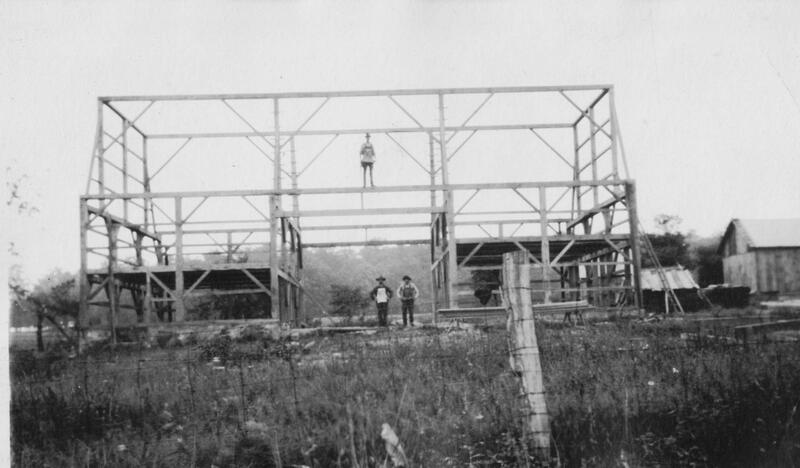 Louis Schumm’s barn was a banked barn but the barn being built in the photos was not a banked barn. Perhaps Louis lost a small barn-type building and the newspaper exaggerated. And perhaps these were photos of a neighbor’s tornado damage and someone else’s barn being rebuilt. I may never know for sure. Newspaper sources for this blog: Willshire Herald, 2 April 1920; The Van Wert Daily Bulletin, 30 March 1920; The Van Wert Times, 29 March 1920 and 30 March 1920; Van Wert Times Bulletin, 29 March 1920; Van Wert Twice Weekly Bulletin, 30 March 1920 and 1 April 1920; and The Rockford Press, 2 April 1920. Nice reconstruction of the incident. Powerful information and good detail. Thanks. Thanks! It is amazing the number of tornados that have gone through our area. I also remember the Palm Sunday tornados. And the tornados that went through our area and through Van wert on a Sunday about 10-15 years ago. Nasty storms! Interesting pictures and stories! Looks like my family kind of attracts tornadoes. The Mrs. W.A. Dull mentioned in the “Willshire Herald” article was my great-grandmother (Florence Rosella [Anspaugh] Dull), and the Mrs. G.M. Clouse was Clara [Anspaugh] Clouse, my great-aunt (“Aunt Clarie”; Bill, Tom, and Jon Clouse’s grandmother). Later on in the article, the “big barn destroyed and fine brick house damaged” in Liberty Township belonged to my great-great grandfather, J.M. Dull (“James Monroe” Dull). When my mother passed away, I found about 30 pictures of the 1965 Palm Sunday Tornado that hit our farm among her belongings. I have spent some time this past fall identifying and documenting them. Perhaps they would make a nice addition to your blog at some point in the future! Goodness! What are the odds of one family being hit by that many tornadoes? I bet they had a lot to talk about at family reunions. I would love to have copies of your photos if you are willing to share them. Your family connections are also very interesting. My cousin married Jack Clouse. My husband worked with Gene Vining years ago at GTE and Bob attended our church for awhile. My great-uncle John married Frona Dull. Are you related to the Dulls from the Rockford area? I may work with some of your relation. It is so interesting how families are intertwined in a community. Thanks for writing. I probably am related to the Rockford Dulls. James M. Dull had 10 siblings, and he himself had 12 children, the oldest of which was Wilbert A. Dull, my great-grandfather. Wilbert moved to Willshire around 1899-1900 and had six children, three boys and three girls. None of the girls had children, and all three boys had girls (seven of them) – my mother’s generation. So our branch of the Dull clan’s name died out with that generation. About a month ago, I realized I had another birthday coming; I also realized I might be the last one in this area that remembered all the names and faces of the “Willshire Dulls,” I thought I better write it all down. That was what I was in the midst of doing – googling different names for birth dates and the like – when I stumbled across this blog. Lucky thing – I have really enjoyed reading some of the different posts! John Vining you are not the only one…. I am a member of this family. My father has a few photos of that day. Florence Rosella Anspaugh (1875 – 1963) was my 2nd great grandmother. My Aunt Pat Doudna is still living in FL. I may have a new challenge for you. 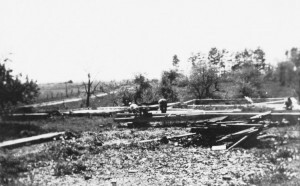 It is pretty well documented that the 1920 tornado swept from southwest to northeast about 4 miles south of Willshire. The 1965 tornado followed a nearly parallel path about 2 miles south of Willshire. One day I was talking to my dad and he said there were THREE tornados that followed nearly parallel paths south of Willshire: 1920, 1965, and 1948. We were traveling down McGough Road roughly 3 miles southeast of Willshire, going past the John/Paul McGough Farm (just west of where Randy and Ruth Rumple now live) and he stated that the “quanset hut-type” barn there was the replacement for the old barn blown down in the 1948 tornado. There is also an nearly identical quanset hut-barn directly to the northeast of the old McGough Farm, just south of the Wabash Road/Winkler Road intersection (i.e. : just south of the old Zion UB Church location). What we know about the 1948 tornado: it was documented at Ohio City, killed two boys at an elementary school in Landeck, and killed a man in the rural Columbus Grove area. From the Farmers Almanac: “Friday, March 19, 1948: A tornado jumped from Ohio City to Landeck to Columbus Grove, Ohio.” Now for the cool part: If you take a ruler and place it over Columbus Grove, back to Landeck, and back to Ohio City, then follow it back to the southwest, this tracks directly back to the far northwest corner of Mercer County – and the two quanset hut-barns. Muddying the waters: I can’t find any reference on the internet that this tornado was on the ground in Mercer County, Ohio – other than a map -tracking the 1948 tornado outbreak – which roughly indicates that the tornado track passed from Indiana, between Willshire and Chatt, and on eventually to the Columbus Grove area. So, the mystery: Did the 1948 tornado indeed start “bouncing” in Mercer County before eventually reaching Ohio City and on to the northeast? Anybody in the Willshire-Chatt area still remember this? That is certainly interesting. I will see if I can find out anything about that storm and put it on my list of items to look up in the old Willshire Herald. One would think it made the local news if your suspicions are correct. I will post what I find out. Thanks for the interesting challenge!